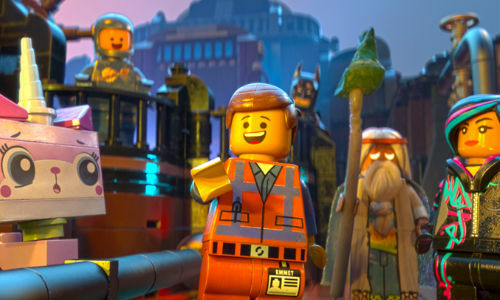 Emmet (voiced by Chris Pratt), the delightfully uncertain heart and soul of The LEGO Movie, is a thoroughly unremarkable construction worker. Which is, of course, exactly as it should be, in a film that happily takes just about every trope and cliche of the fantasy world, and with more than a few gleeful postmodernist wink and nods, uses them to its own highly amusing, extraordinarily clever advantage. And what is more happily cliched that a protagonist with not much in the way of a worthwhile life (yet oddly, a fervent belief that “Everything is AWESOME!”), with a predilection for following every rule there is no matter how oppressive, a love of $37 coffees, and an instruction book to guide his every move? A proto-hero everyman who is suddenly, and yes accidentally, called on an epic quest that will alter the course of LEGO-dom as everyone knows it, with help from a motley posse that includes a more than capable femme fatale (Wyldstyle, voiced by Elizabeth Banks), her possessive boyfriend Batman (Wil Arnett), a stoic wise man (Vitruvius, voiced by Morgan Freeman) and yes even a unicorn kitten hybrid by the name of Princess Unikitty with repressed anger issues (Alison Brie). Naturally there must be a Bad Guy (the capitals are naturally obligatory), in this case Lord/President Business (Will Ferrell), who rules the various lands of LEGO with a plastic fist, and who, in possession of the mysterious, glowing Kragle, is set to forever control everything about his colourful, endlessly versatile LEGO subjects. It’s a crazy, madcap, thoroughly fun-filled adventure waiting to happen, and when it does spring to life, courtesy of riotously colourful animation from Australia’s Animal Logic who magically make CGI look like stop motion animation of real LEGO bricks, and a pop culture literate script and inspired direction from Christopher Miller and Phil Lord (Cloudy With a Chance of Meatballs), it’s that rare movie – a delight from start to finish. It has so many gags, visual and verbal, thrown into its barely-pausing-for-breath running time that you will likely need to see it again and again just to take it all in. Suffice to say, the ones you do catch will have you and your inner child laughing like a loon every 2.5 seconds or so as Emmet is dragged from one brilliantly-hued scene to another, from land to land (among others The Wild West, Middle Zealand and the candy-coloured magnificence of Cloud Cuckoo Land), riding all manner of Master Builder constructed contraptions, pursued all the way by Lord Business’s ruthless (and yet not) head of the Super Secret Police, Good Cop/Bad Cop. That you see the plot coming from a mile away is immaterial (the unexpected twist at the end notwithstanding). You are meant to, and frankly it’s hardly the point of a movie more concerned with making merry with the sort of cliched tropes of the fantasy genre that you might have thought were long spent of the ability to surprise than re-inventing the classic quest narrative. 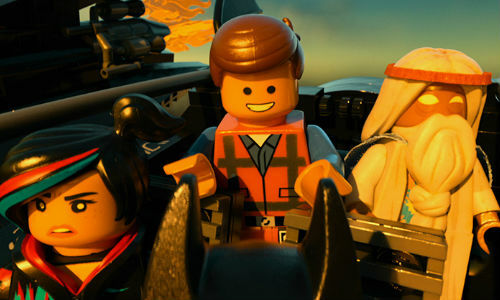 The LEGO Movie, which has been maligned by some as one long toy commercial (of course it is; any Gen X’er who doesn’t realise that going in didn’t pay much attention to their childhood, which were full of them, some good, many bad), joyfully takes the mickey out of the supposed rivalry between Dumbledore and Gandalf, the wannabe friendship between Green Lantern (he wants it) and Superman (he doesn’t), and Batman’s dour, “I’m an orphan” sensibilities along with a thousand other pop culture moments. 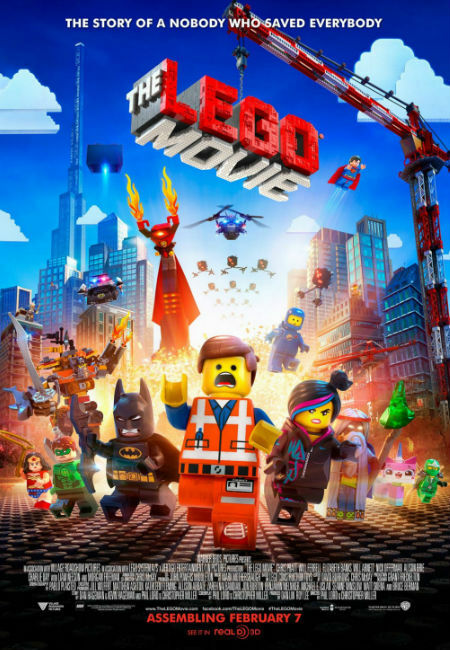 No icon or reference is safe from laugh out loud satire, and it’s their sophisticated rapid fire delivery that lends The LEGO Movie much of its full speed ahead, colourful as a candy store look and feel. A deliriously happy grin-inducing concoction, The LEGO Movie manages to channel the endlessly imaginative possibilities that anyone who has ever played with the legendary Danish blocks will easily recall, surrounding them with witty, well-rounded characters, gags aplenty and a much needed reminder that life can indeed be mind-blowingly fun and yes, of course, awesome.